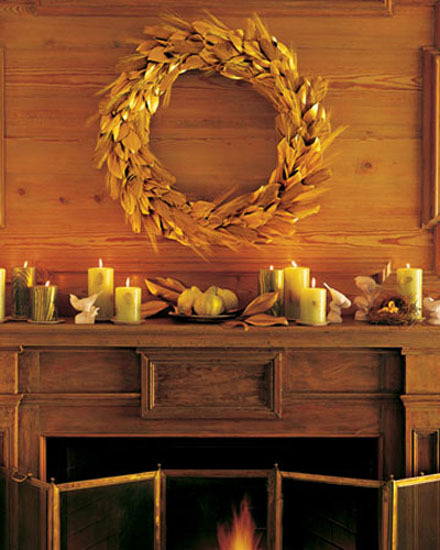 Fall ideas offer natural materials for Thanksgiving decorating. 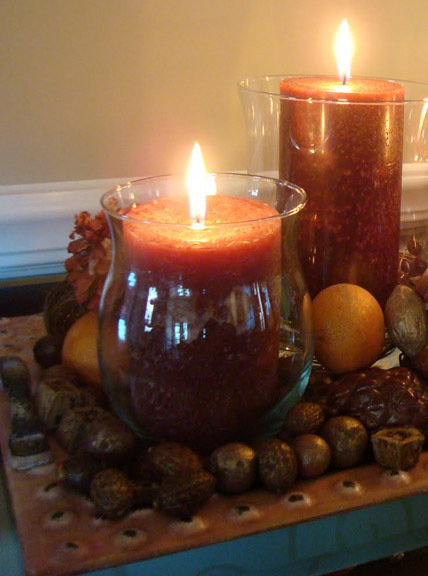 Fall leaves, tree branches, acorns, pine cones, dried fruits, corn, pumpkins, and fall flowers make beautiful holiday table centerpieces and home decorations with candles for Halloween, Thanksgiving and special events in fall. 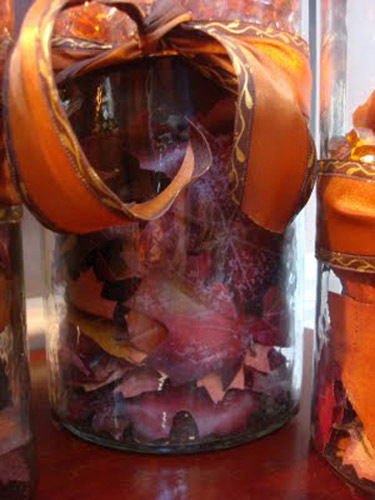 Autumn comes with spectacular foliage colors. 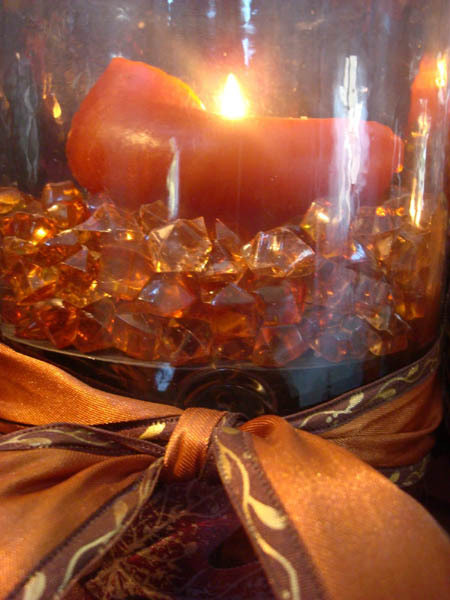 Fall leaves and candles, used for Halloween and Thanksgiving decorating, combined with tree branches and grass in brown and golden color shades, acorns and pine cones, dried fruits and corn, pumpkins and fall flowers, add warmth colors, unique textures and charming glow to any room decor, creating beautiful, relaxing and festive atmosphere for fall holidays. 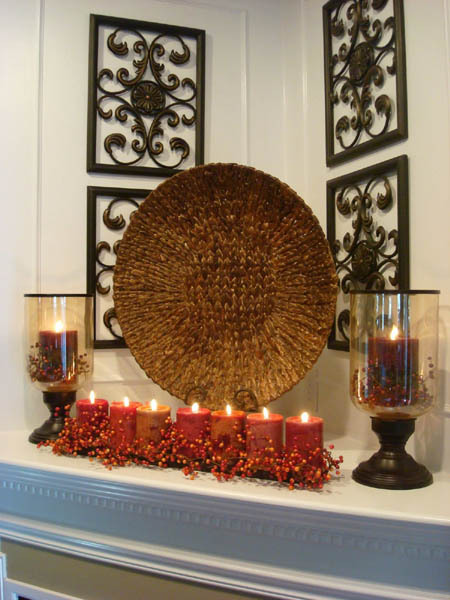 Fall leaves and candles centerpieces attract attention, bringing soft brown, yellow, orange and red colors into your living room, kitchen or dining room decor and creating the beautiful color palette with gray, green and cream shades of home furnishings. 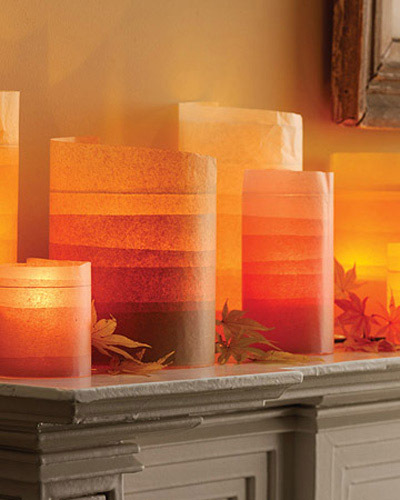 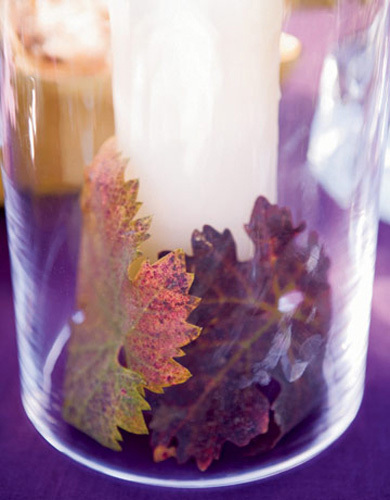 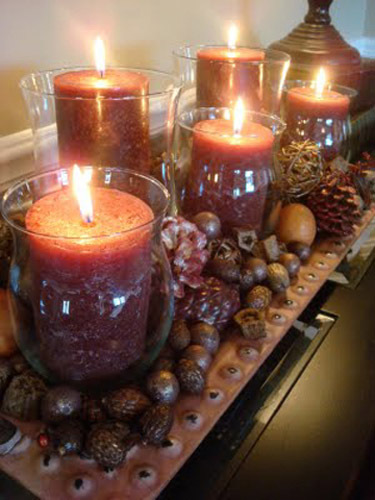 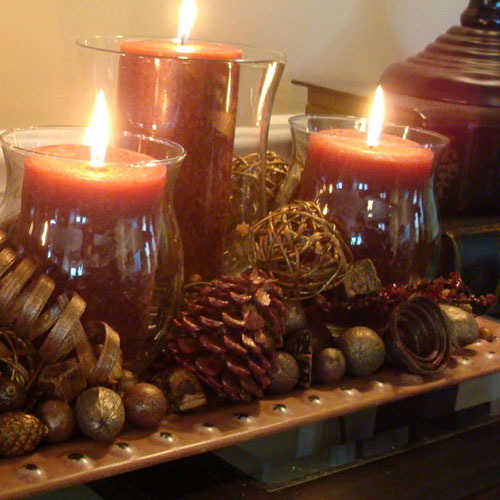 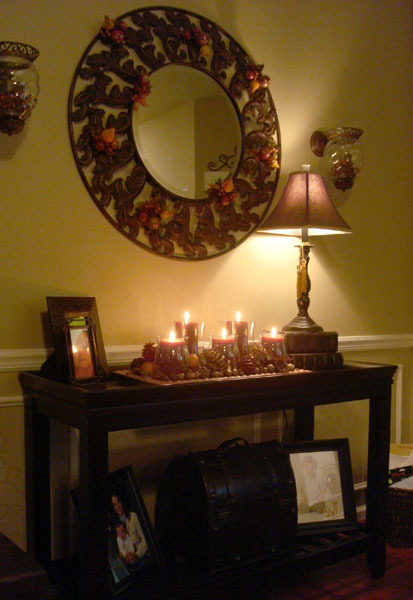 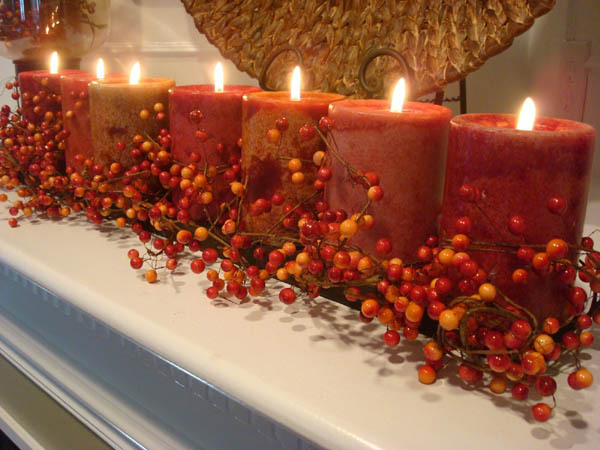 Fall leaves and candles inspire simple and dramatic table centerpiece ideas, that is inexpensive and elegant. 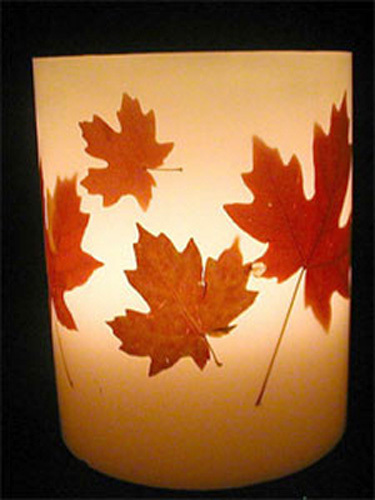 Fall leaves and candles centerpieces can be decorated with nuts and berries, tree branches and beach pebbles, white and brown bean, driftwood pieces and tall grass, acorns and pine cones, dried fruits and corn, pumpkins and fall flowers to make unique holiday table centerpieces and home decorations that will surprise and delight. 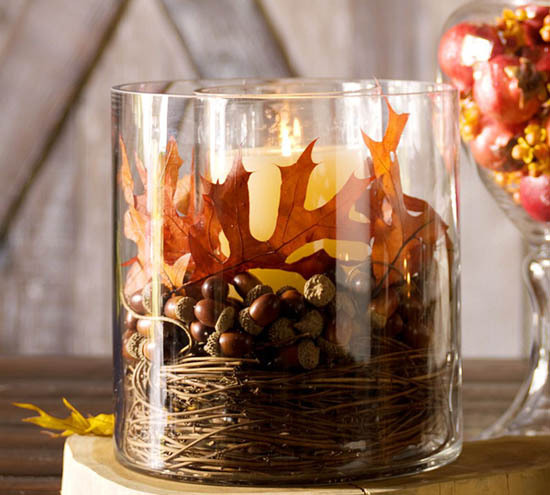 Fal leaves and candles offer gorgeous table centerpiece ideas that look colorful and interesting in daylight and mysteriously glow at night, adding romantic mood to your kitchen or dining room thanksgiving decorating. 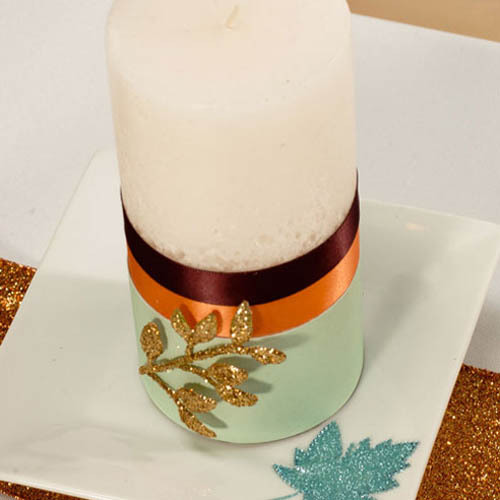 Soft and bright, welcoming and charming elegant centerpieces with fall leaves and candles add harmony and warmth to fall ideas. 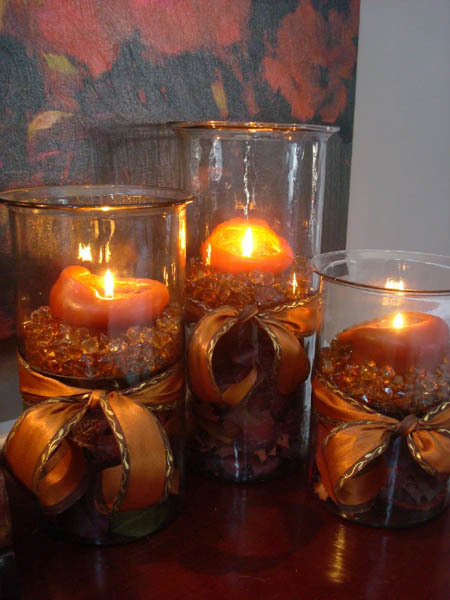 A light palette of soft gray, cream, and shades of yellow, orange and red colors create classy and elegant centerpieces for your room decor. 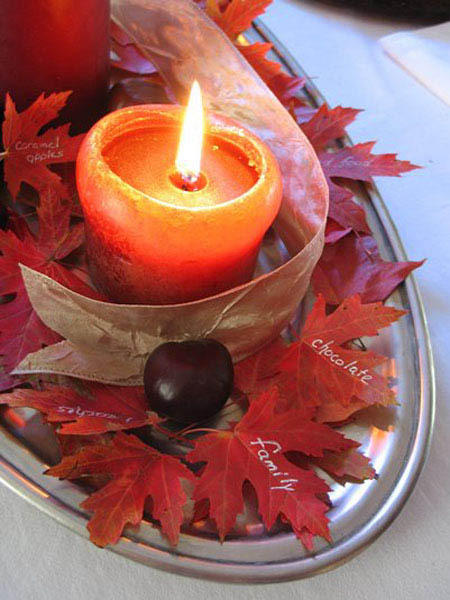 A basket with fall leaves, surrounded with tea candles makes simple and dramatic table decoration for eco-friendly homes in fall. 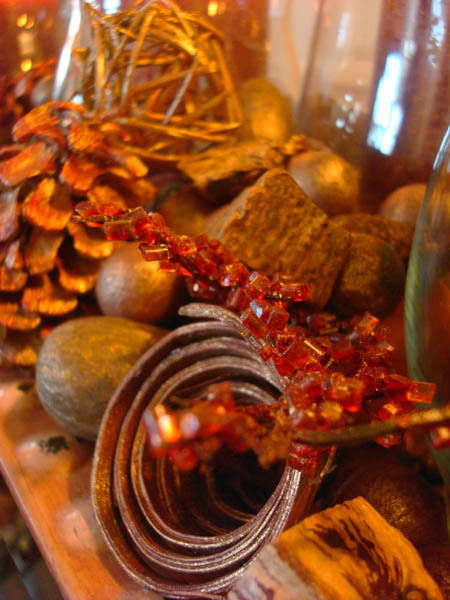 Adding a strip of cotton fabric, lace or cream burlap and filling the basket with fall leaves, apples, pears, cipollini onions, tree branches, acorns, pine cones makes thanksgiving decorating ideas more exciting and eco-friendly. 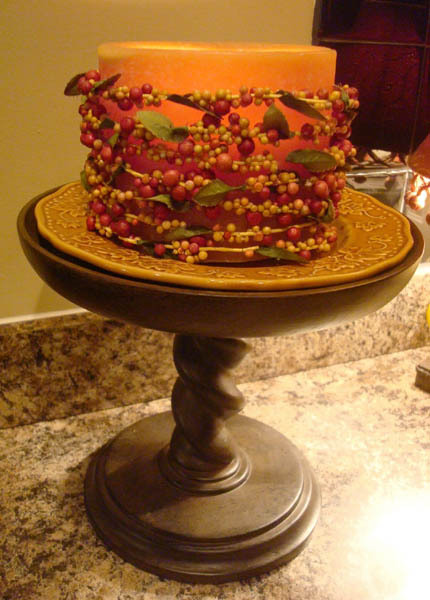 Setting your table centerpiece on a platter allows to move it quickly to make room for the Thanksgiving turkey. 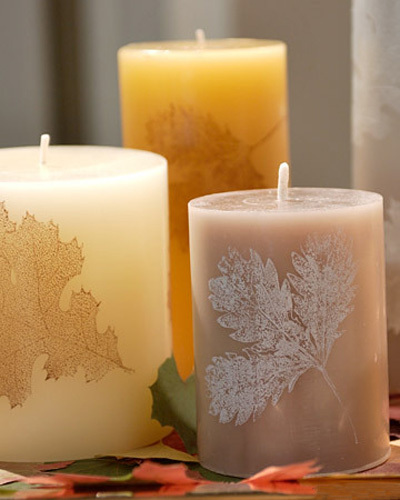 Soft white and golden color hues, combined with fall leaves and small candles dance in natural lighting and add unique, flowing in the darkness Thanksgiving centerpieces for holiday dinner table decoration. 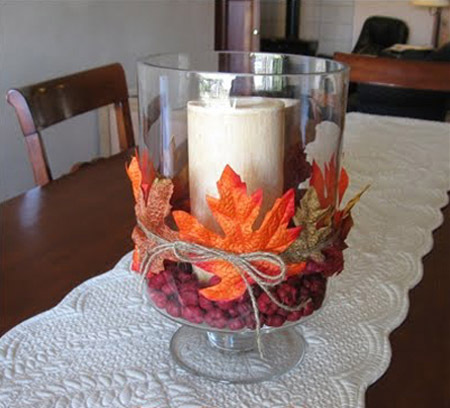 A vase filled with wheat and fall leaves adds texture to the table centerpiece. 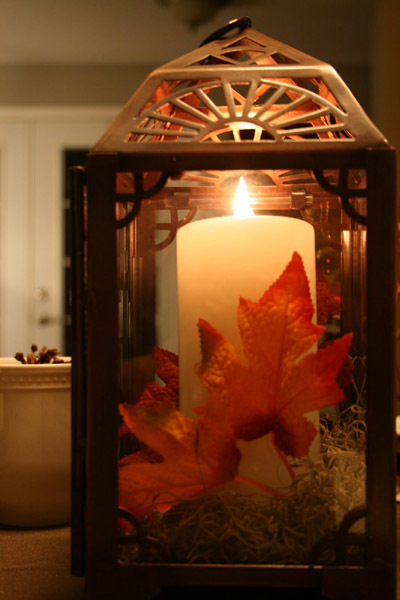 Filling a glass vase with dried white and brown beans, adding a berried branch and tea candles to complete the table setting is another idea for Thanksgiving decorating and creating elegant and straightforward centerpieces for all fall holidays.